“They’re saying we can’t use our tent!” exclaims a slightly panicked volunteer, rushing into the crowded exhibit space. “Can we do something so that they don’t touch the model?” asks another anxious, nametag-wearing woman. “Good luck with that,” replies her colleague, dryly. The Saturday morning crowd for the opening of Markham House is equal parts bright-eyed (and mildly stressed) volunteers, and curious local residents. Just south of Bathurst and Bloor they mingle in a space that features brightly coloured leaflets and the aforementioned model that will be the centre of attention: one that displays Westbank Properties’ redevelopment plans for the historic Mirvish Village area. 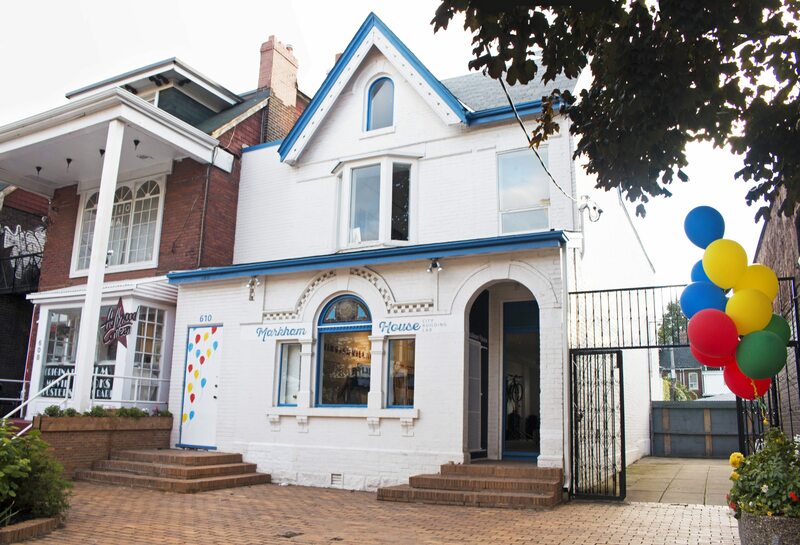 Located at 610 Markham Street, across the street from local mainstay Suspect Video, the House aims to educate local residents about the proposed development. Dubbed a “city building lab and community hub,” by developer Westbank, the plan is to use the space for installations, workshops and events meant to create a discourse about the future of the neighbourhood. On July 10, the City Planning Division received applications from Westbank to redevelop several properties within the Mirvish Village area, including much of the west side of Markham Street. The application comes after Westbank bought the historic Honest Ed’s site and surrounding properties in 2013; the discount emporium made famous in Scott Pilgrim is slated for closure in the winter of 2016. “Mirvish Village is a beloved and iconic neighbourhood,” writes Westbank project manager Peter Venetas in an email to Torontoist. He goes on to explain that in creating Markham House, Westbank is attempting to create, “a physical space where [local residents] can learn more about the development application…[and] speak to individual team members.” The house’s first event, held on the busy Saturday morning of September 19, features cycling, micro-retail and the celebration of cultural heritage. 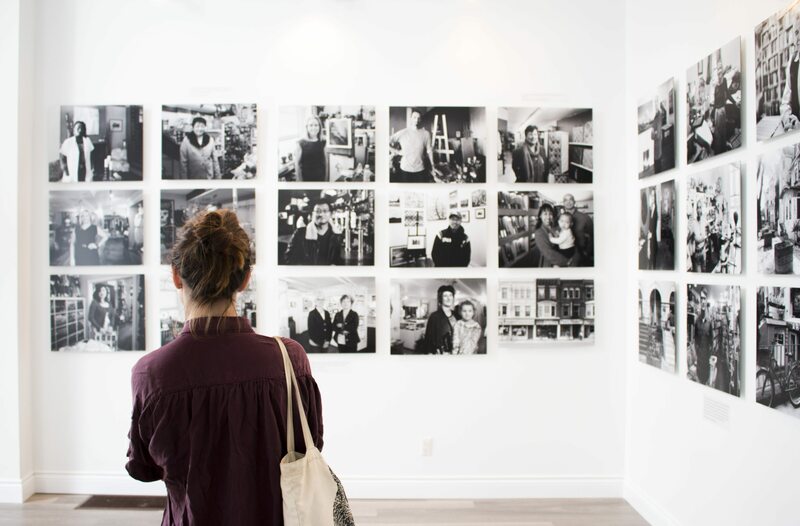 Curbside Cycle offers a bike valet for cyclists, and the Charlotte Hale & Associates Gallery features the photo installation “Mirvish Village People” on the second story. Westbank’s redevelopment plan features 1000 rental units, and an all-season market hall. Fourteen Markham Street houses will remain on the property as heritage sites. It also hopes to create a “pedestrian-friendly and programmable” Markham Street, which Venetas says has the potential for “events like outdoor films and community festivals.” While he says these aspects of the plan have been received warmly, skepticism towards the project remains. Susan Dexter, University of Toronto Liaison director for the Harbord Village Residents’ Association (HVRA), has her reservations about the project. Calling it part of Westbank’s “charm offensive,” she says she feels that the House may take away from the public discussion that City planning will be facilitating. “It’s the sales office, basically, for Westbank,” she says. Dexter adds that she is concerned that while Westbank may be consulting with neighbourhood resident associations, it looks more like a campaign that targets the City as a whole, instead of the neighbourhoods that will be directly affected by the development. “The wider city may get attracted to the buzz, but it’s arriving in the middle of four functioning stable neighbourhoods with houses not even a block away,” she said in a phone interview. While Markham House’s next event is yet to be announced, discussion of the proposed development is about to heat up. The Toronto/East York Community Council will consider the preliminary report for the application at today’s meeting. The City will hold two Statutory Public Consultations about the project, with the first on October 7 at the Bickford Centre.